car is built like a brick *&%t house!! after roughly 6 or 7 race days including practice there is not even a sign of excessive slop in the suspension components..
anyone having trouble getting on the hobbypro site. It appears the site is currently down, there may be an update to the site shortly as well. Thanks for the update. Trying to order some items and even the email jumps back. Can anyone share a price for this buggy? I too checked out the site and its down. I also would like to try something different from the big 3 & I'm hoping the price point is more around the b4.2 range. SWEET! I'm also hoping they re-think the red anodizing to a more neutral color, like the color of the aluminum front caster blocks would be better IMO. Thanks C Branch! Hey guys sorry for the site troubles! The hoast server completely disappeared so Andrew is rapidly building a new site that will be better than ever! It will be back up by Friday. Thanks Aaron for the update! I saw this buggy for the first time this weekend at IERC. It was sweet. I believe Andy won the mod class. He showed me the buggy and said they would be going for 279.00. That's a great price. The buggy has a ton of options like the shock mounts along with battery location and size. I may be mistaken but I think it can be eithier mid motor or rear. Andy was very cool in taking the time to show me the buggy and explain some of its features. I'm thinking about getting one after they have been on the market for awhile. 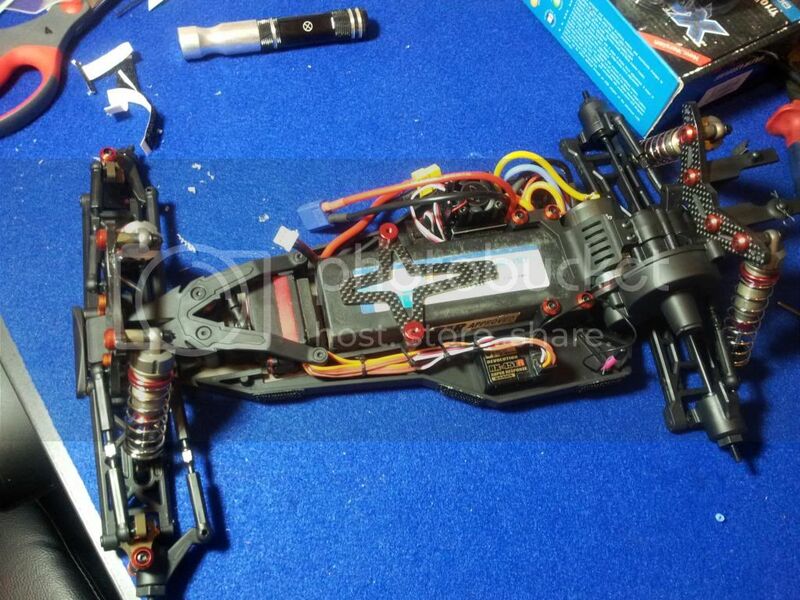 yes they can be built either mid or rear motor.. all the parts are included to do so. I hope the site comes back up soon! Especially with the beginning of the month coming up soon! how did I miss this thread ? thats a sweet looking car. fwiw I like the red, you could choose a worse color but ya gotta do what ya gotta do. Lets see some pics in mid-motor mode. I see two different bodies, does one body fit either configuration ? The cab forward one on the rear motor cars is way better looking than that boxy one on the mid motor cars. Great to see an alternative and someone who is behind their product. TQed and finished 2nd this weekend at the Top Gear Hobbies Spring Shootout with the S1. I ran the buggy in mid motor and it was absolutely dialed!! !